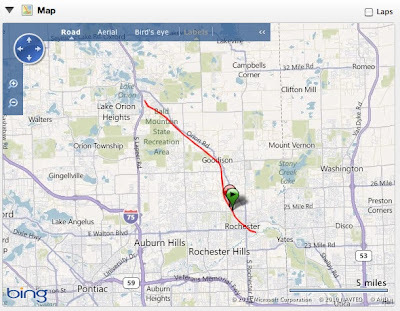 DETROIT RUNNER....: 20 miler yesterday...I'm tired! 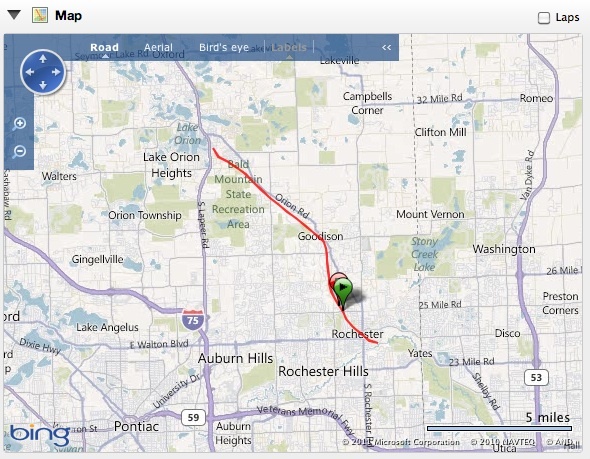 As you can see from the splits above, I was feeling fairly good and was able to pick up the pace the last three miles. This is giving me some good hope that I can meet my goal of 4 hours. The plan is to run with the 3:55 pace group at the Detroit Marathon. This way I won't go out too fast and should have a 95% chance of meeting my goal....assuming I can hang onto that pace group. My running buddy, T and I decided to run the Paint Creek Trail. As most of you know, I love running there for my long runs that are 18 or more. The limestone is ideal to run on. Based on today, that gives me 1 hour to complete another 6.2 miles. If this were a 10k only, no problem, but I know how I feel during the last six of a marathon so I'll stay cautiously optimistic. If it's meant to be, it's meant to be. We ended up parking off Tienken since the Rochester Arts and Apples was going on this day. Where we normally park, it was handicap parking for the day. Since the trail is only 18 miles, we ran back to Rochester up to the Clinton River Trail and then ran to Lake Orion and back to our car. It was a good day and I'm hoping I'm feeling that good on race day. T also did an awesome job out there today too. Question of the day? If you're doing a marathon, have you got your long run in yet? Great job, Jeff! You will hit that 4 hour mark easy, especially now that you know what to expect on your marathon. Wow, you are fast! Good job!! My long run was Saturday too. 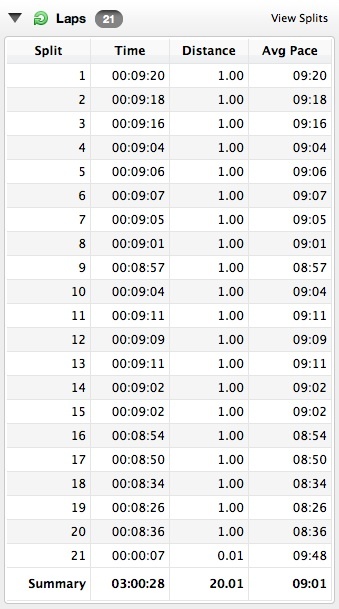 Nice job on getting negative splits towards the end! I love it when you realize you have extra energy to push it. Great job!!! I think you will meet your goal. My longest for this current training is 17 so I will have a few more weeks to wait for mine. Sounds like you have a nice route too. Wow! Great pace. I hope I can do as good as this when I start training for my first marathon!! Check out those last three miles - Awesome! Nice job on that 20 miler. Your split are great. You are going to do awesome in the Detroit Marathon. Thanks everyone. Hoping that last 6.2 goes as well. Nice 20 miler, and good work with the consistent splits. I'm now living about 1/2 mile from where the Paint Creek and Clinton River trails intersect, and I think you made a great choice on your route. A wonderful place to run!